There's many ghosts to chase in this part of the country and for you who are ghost town-conscious we have Jerry Smith to show you the way. Many of Northeastern Washington's most picturesque abandoned sites, whose yesteryears were as colorful as they were lively, are waiting for you to enjoy. Travel on a daylong exciting Old West ghost town tour and relive those historic days of yesteryear. Head out to historic Okanogan County it is not just a myth…it is a legend! See for yourself historic buildings and sites from Boom Town days past, ghost towns, mining camps, gold and silver mines, and much more. We invite you to step back in time on a Wild West ghost town tour with your own experienced adventure guide. All ghost town tours depart from the Wild West Frontier town of Winthrop unless pre arranged in advance when booking. We wish you a great adventure! Don’t miss out book early! A booking confirmation will be mailed to you after you’ve made your reservation and deposit. Read our customer testimonials from recent Boom Towns & Relic Hunters premier guided ghost town tours. We Offer Several Unique Ghost Town Tour Packages to Choose From! Historic Tour (A) full day (9-10 hours) scenic trip-destination: Price $110 per person. Old Molson: See first hand why the memories of Old Molson's glory days still linger in the weather-worn buildings of a ghost town that just refuses to give up the ghost. Though the miners and their dreams of riches are long gone, the buildings and scenery remain virtually untouched. Old Molson is certainly one of the best preserved mining ghost towns in the county. 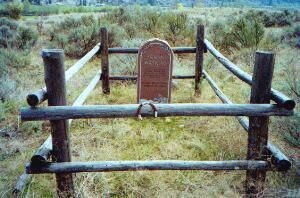 Included in this tour we will visit the historic gravesite of the notorious desperado Frank Watkins. It's off to Riverside and the saloon, now a "ma and pa" store where the desperado had his shoot out. Visible in the ceiling today the three bullet holes from Frank's six shooter during his dispute with the bar tender around 1904. See the famed Hee Hee Stone of which many Indian legends abound. We'll go through Chesaw, a former mining town named after a Chinese miner of by-gone days and on to the mining camp of Bodie. Here we will be able to walk through and explore abandoned buildings from this classic ghost town camp. Historic Tour (B) full day (7-8 hours) scenic trip-destination: Price $125 per person. Ruby City: Walk the dusty street of Ruby historical site, or as it was known before incorporation, "Ruby City." We will visit the site of Ruby where once saloons were full, gunfights reportedly were common, and the inhabitants, (mostly miners) experienced fires, floods, and the fear of Indians on the warpath. It was one of the liveliest and best-known mining camps in the Northwest. Additionally we'll see Frank Watkins gravesite and Riverside (as noted in tour "A"). We will be seeing a time capsule of the past at the Okanogan County Historical Museum. 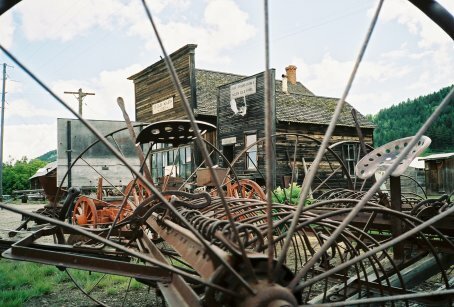 This museum features a replica of an Old West Frontier town of the early 1900's. You can get an idea of what life might have been like "way back when." Check out St. Mary's mission located on the Colville Indian Reservation. Father de Rogue, a French Jesuit, founded St. Mary's mission in 1889. Chief Joseph and Chief Moses attended services here where Father de Rogue predominately spoke the Salish tongue of the Native Americans in his work with the Indians. The mission remains today known as Paschal Sherman Indian School. Okanogan County's relic of the past, the mysterious "China Wall"
Historic Tour (C) half-day (4-5 hours) scenic trip-destination: Price $ 110 per person. 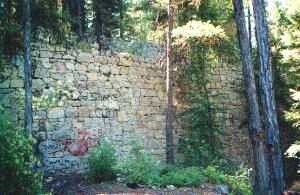 The China Wall: Experience Okanogan County's relic of the past, the mysterious "China Wall." This tour takes us to Jonathan Bourne's Arlington Mill. These fascinating sets of granite walls built in 1899 on the side of Ruby Hill appear to be the remnants of a Medieval Fortress. The great stone walls are up to three feet thick, the huge blocks of granite tightly fitted, the corners perfectly squared. The largest of the ten walls measures eighty feet long and twenty-seven feet high, built using block-and-tackle method. When completed this was to have been a concentration mill for ores from nearby silver and gold mines. The massive granite structure is one of the most enduring and mysterious of Okanogan County's relics from the past. In addition, all tours include hands-on metal detecting lesson for those lost treasures and surprise relic from the past. Each of our special guests will receive a "Boom Towns & Relic Hunters of Northeastern Washington State" souvenir T-shirt, sizes limited. We provide complimentary ice cold bottled water and soda with our tours. Please bring your backpack, lunch, camera, and a good pair of day hiking shoes - tennis shoes are not recommended. Bottled water will be available from your guide. Each of our special quests will receive a “Boom Towns & Relic Hunters” souvenir T-shirt. Sizes are limited. We provide complimentary ice-cold bottled water and soda with our tours. * All tours are "at your own risk" and you are responsible to use good judgment to insure your personal safety. Guide service is not held liable for damages to vehicles or health and safety of tour guests. 1.Cancellation policy: 50% charge for less than 72-hours notice. 2. Boom Towns & Relic Hunters Premier Ghost Town Tours reserves the right to alter, modify, or cancel any tour due to weather or unsafe conditions. 3. Full refund given if tour forced to cancel. Hotel accommodations in a variety of resorts, dude ranches, bed and breakfast are available to fit any budget. At Methow Valley Lodging you can find a resort or hotel in the Methow Valley to relax and enjoy your Wild West vacation. Summer Tours run from May Through August.